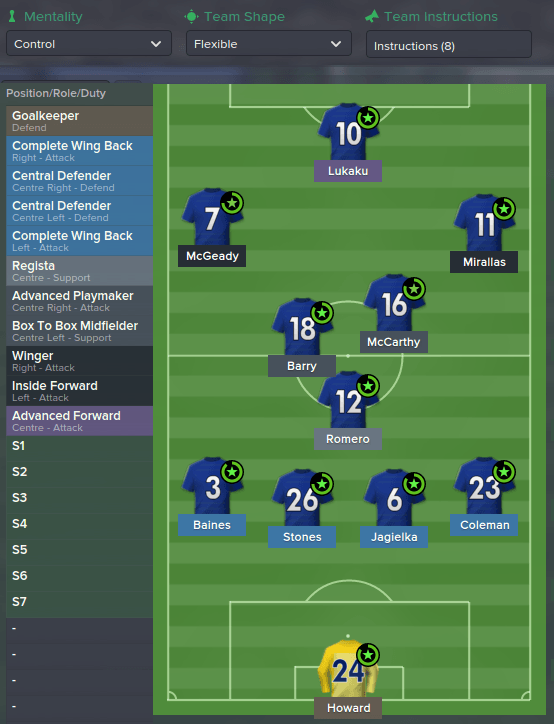 Hey guys and welcome to our best FM 2015 tactics series. 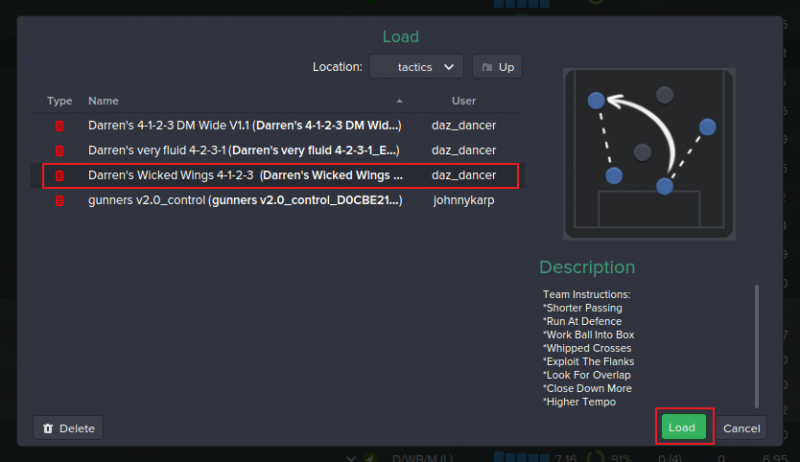 As many may have noticed the wings can be exploited in FM15, my tactic evolves around this and as a result I named it Darren’s Wicked Wings. The formation could be perceived as a 4-5-1 or a 4-3-3 but I prefer to call it a 4-1-2-3, you can see the shape below. 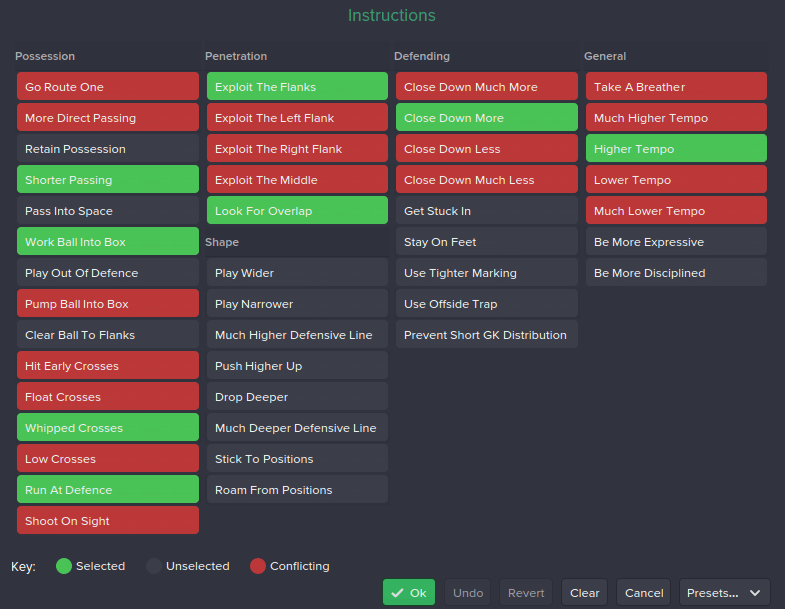 All our best FM 2015 tactics are tested until we feel happy with the end result, but they will only work with the right players. This tactic for instance was tested with Everton and suits them well. Other top flight clubs (mainly top half teams) should be suitable if they posses the right players to fill the roles. All testing took place on patch 15.1.3, we don’t have a crystal ball and can’t guarantee this working in future patches. The strategy is very, very important to whatever success you have with this tactic. I generally use control when facing easy opposition at home. I’ll change to counter against very tough opposition and during away matches. What you’ll find is the team seem to struggle with the counter strategy at times, but it can scrape results when you may have lost using control, counter can also help pull lesser opposition onto you away from home leaving gaps to exploit. This all comes down to your team so you’ll have to gauge the strategy as you play. If dominated when using counter strategy, switch to control, this should help take the match back but only if you avoid being caught out. As you can see the shape is very simple. A flat four with a triangle in midfield and another triangle upfront. You’ll notice the wings are very adventurous with two complete wing backs, a winger and inside forward this will take advantage of the AI’s weakness down both flanks. Time and time again I have been caught out on the wings, so I decided attack was the best form of defence, it seems to work well. Your striker should score a reasonable amount, while your winger and inside forward should chip in heavily also. The wing backs can provide a high number of assists and if the advanced playmaker is well suited he’ll be up there in the ratings also. Please note there will be times when adapting is inevitable. You may have taken the lead and come under intense pressure, depending on where this pressure comes from you should adjust roles. If the wings are getting hammered then adjust the complete wing backs to full backs, if you are struggling through the middle then maybe the regista needs changing to something less aggressive like an anchor man. In this years game you must use common sense, those hoping for click and play tactics or easy answers, you’ll be looking a long time. Simple instructions, I set the dribble more and whipped crosses to exploit the match engine as both are tough to handle. We have covered the wide areas as a problem for the opposition, so exploit flanks and look for the overlap are selected. I always prefer a higher tempo and work the ball into box seems to limit silly long shots. Shorter passing is to keep the possession stats reasonable without having to set retain possession which I feel can see you run in circles on occasion. 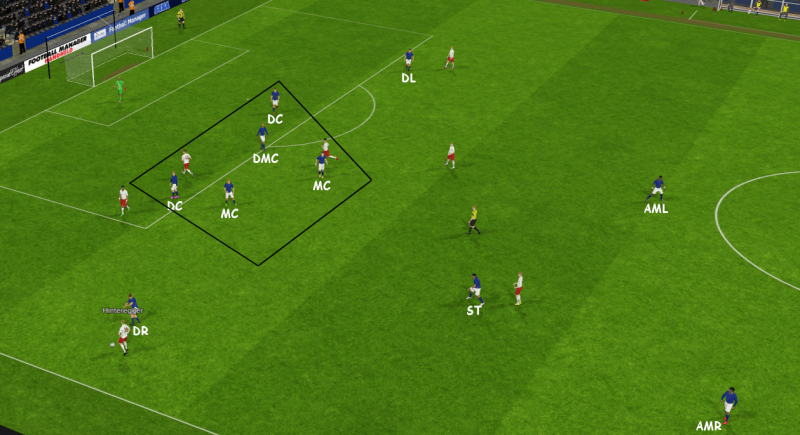 DC’s: central defender – defend – Nothing specific required other than your general defensive attributes. Good heading and jumping will really help with the excessive crosses we endure in FM15, but acceleration could be useful also. DMC: regista – support – This guy will do it all, win the ball back then look for a pass to start your next attack and even move the ball forward himself. Good physicals are a bonus, work rate and tackling are very important alongside the usual attributes for this role. MC: box to box midfielder – support – We want someone with acceleration, dribbling and great work rate for this role. He will run up and down the pitch, good shooting ability will be a bonus and you ideally need the complete midfielder, one that can attack as well as defend. MC: advanced playmaker – attack – Your creative outlet through the middle, we are looking for passing ability, technique, vision and good dribbling ideally supported by decent pace and acceleration. This guy needs to move the ball forward then pick out your striker and wide men. AMR: winger – attack – Very important, this guy must be fast, skillful and a competent dribbler. The better he can cross the more goals you’ll score. A second rate winger will see your performance drop drastically. AML: inside forward – attack – Just as important, your inside forward needs to the same qualities as above. However, he will also look to move the ball inside and open up the defence. The better this chap in front of goal the bigger impact he’ll have. ST: advanced forward – attack – I can’t overstate this, your advanced forward must be an all rounder. He is on his own, so should have no less than 13 for acceleration to move away from defenders. This tactic relies on crossing so the better he is in the air the more he’ll score, but I”d put speed above that. You also need the AF to create his own opportunities. Lukaku, Destro and Ferreyra would work well, maybe someone like Mitrovic and as an alternative Fierro. The screenshot below demonstrates our defensive shape. Both wing backs will go out to challenge the flanks, while the AMR and AML will run back to track runs, or stay forward depending. All other defensive or supporting players huddle in the middle to form a barrier.The two DC’s with our DMC just in between and then the two MC’s in front of him, this huddle will be broken to close down the opposition and depending on your strategy. The more adventurous you are the harder it becomes for them to get back and maintain this shape. Once possession is won there are many options as shown in the screenshot below. The complete wing backs can charge forward, offer responsibility to the DMC or try a long pass to the front three. Both MC’s will offer themselves to get the ball, while the winger and inside forward will vary, they will either hug the defensive line trying to break it or drop deeper to get on the ball. Now for the attacking phase and an all out onslaught. That about describes what you’ll see in the ME, somehow due to the DMC’s stability, the B2B midfielder and complete wing backs been so willing to work back its rare we get caught out. But you’ll see the screenshot below shows a lot of blue shirts in the attacking third. 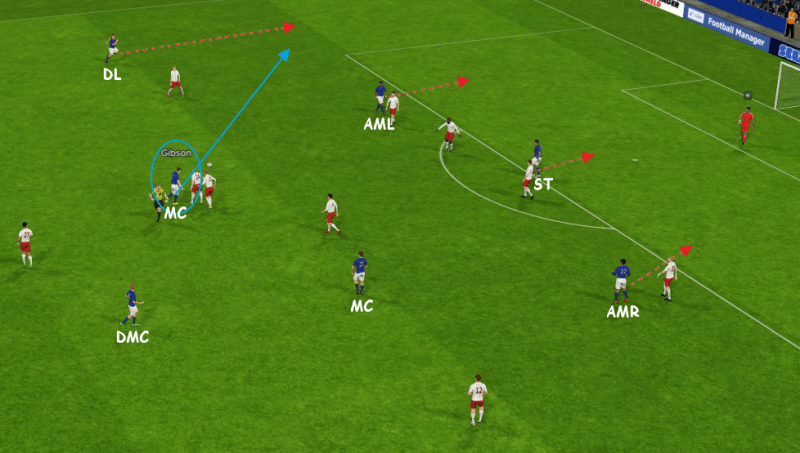 When the ball is centre stage, the AMR and AML squeeze in and sit just off the striker forming a front three, the DMC sits while the two MC’s hold their ground working the ball forward waiting for a pass. The two complete wing backs have no limit to their ambition in driving forward making for a lot of passing options. This should overwhelm your opposition and is why you must get the strategy right, as too attacking will leave you exposed and too conservative won’t lead to enough players taking risks. The video below shows some of the play possible with this tactic, you’ll notice a lot of goals coming from the wings. Please watch in 1080HD for the best viewing. This competition was used to rest players for my main focus, the league. Yet we still reached the semi-final and were unfortunate to lose over two legs to the eventual winners, Arsenal. After beating Burnley and West Ham with a weakened XI we were robbed against Man Utd during a match we dominated. I again used this competition to rest players, yet we still progressed and quite easily. It wasn’t until the quarter-final that I really started fielding a strong XI as we won the competition. In my opinion our EPL form was nothing short of brilliant, we won when it was expected and even pulled off some shock results. Bar one or two slips, I can’t see a bad result in there and for me that shows a stable tactic. You can’t argue with the table, Chelsea were immense, untouchable. So to be second with ease and on 82 points is great. Some seasons that may take you close to a title challenge. Not many, just Lucas Romero and Gaston Gil Romero to rotate as box to box midfielder and regista. Then in January I bought Depay for the left wing. Every tactic needs time, I didn’t see Everton in full flow for about 6 to 7 games. You must have the right players to use this tactic, I have already highlighted what is required. If it doesn’t work, then chances are its your selection, team talks or strategy that are the issue. For opposition instructions just ask your assistant manager to set them every match, he tends to know best. Your AM won’t always be right, but unless you know what to look for in his errors, leave the instructions to him. Without these instructions been done properly the tactic won’t work. This tactic has been tested in patch 15.1.3, I can’t guarantee it working past that point. 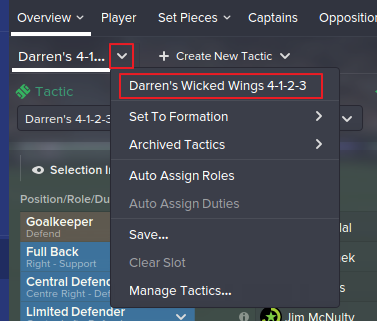 4) Select ‘Darren’s Wicked Wings 4-1-2-3’ and click load. As shown below. Have you followed my instructions to the letter? If you have it should appear. At what point is it not appearing, I need more details if I’m to help. 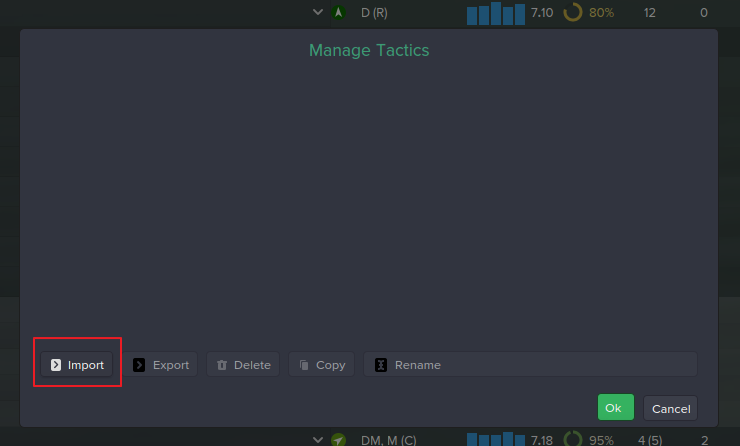 If you look in the folder where you moved the tactic ie sports interactive/football manager 2015/tactics is it showing there? If so run me through the steps you have taken and at what point it isn’t marrying up to my instructions. You’re not giving me any detail, at what point is it not there? I asked you run me through your exact steps? Please re-read the comment above as it has been updated, have you followed those steps? where its supossed to chose/ your tactic among other downloaded tactics, its just not there, there are all the other tactics except yours. 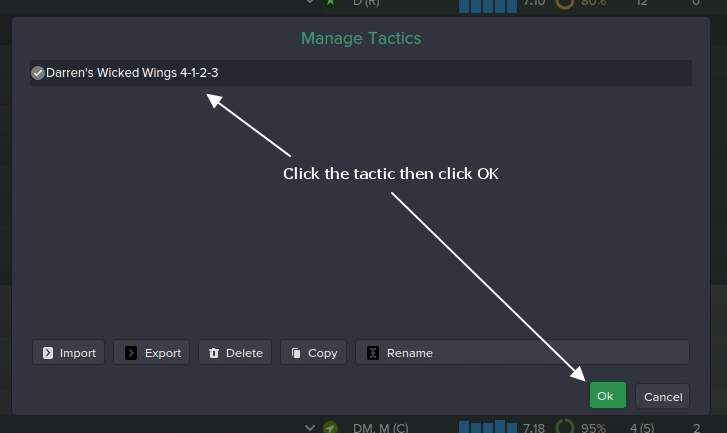 Are you saying that once clicking ‘manage tactics’ it does not show as a tactic to download? Yes I understand it isn’t showing there, but there are steps before just looking in archived tactics you are not mentioning. got to the point where you import the tactic? The image attached shows how to find it. Good, glad you managed to download it. I see people are having issues here. The tactic is there. The point is that its and FMF file not TAC file. When choosing a tactic, go to “Import” there you can choose this tactic and it will be loaded. Thanks Silvano, appreciate that. I have updated the post with more precise instructions for downloading. Hello Darren. I see in your screens from imported tactics that you have gunners control v2.0 made by JohnnyKarp. As an Arsenal fan I am curious if you will post it soon? That will not be published no. 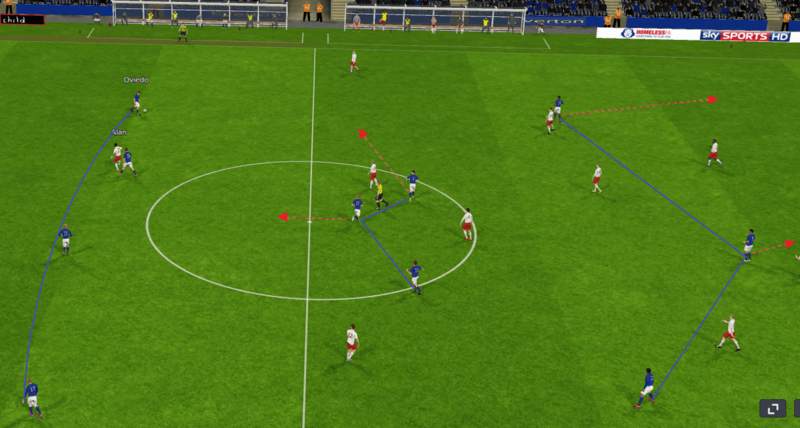 It was a tactic Johnny was working on ages ago and I downloaded just to test the new uploading system in FM15. Seen as Johnny hasn’t published the tactic I assume it doesn’t work. There won’t be a steam file I never mentioned that, just follow the instructions and if you struggle at any point chances are you can’t upload in the demo maybe. I see, glad you got it working. Thanks Pat. As for your issues against the 4-4-1-1 I haven’t really focused in on that formation TBH, so couldn’t offer much advice. Not sure what the answer is without testing. How much did you pay for depay in january? About £12 million I think, same with Newcastle but then Spur’s had to bid £18 and other upwards so it does vary. Great tactic! Came second with southampton. Also tinkered with the team instructions but mostly in match and didnt set on anything new. Started the match with the original intructions. Chelsea ruled, as in your Everton save. Well done mate, glad it worked for you. Chelsea are frustratingly good this year! Interested to see if it works also in the 2nd season. Defence left something to think about. 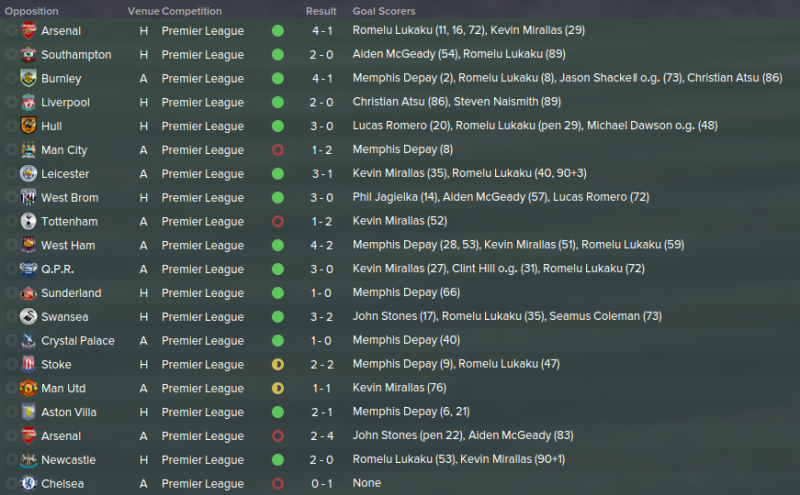 Cant really concede that many (50) if I want to take it to the next level and succeed in Premier League (win it!) and CL. Had some pretty epic turnarounds from 0-3 to 4-3 but cant see us doing that agaisnt the top teams. Maybe change the complete wingbacks to something more defensive? You could try that, its all about finding the balance, all I’d say is that the wing backs do offer a threat going forward that may be lost if you change the role. Finding the right use of control and counter can be the hardest part to manage. I would say having at least 1 star talent distributor at complete wingback is key to making the offense run better. I highly recommend Calum Chambers for this tactic if you can afford him. 1 goal and 12 assists in 38 appearances for my Liverpool side in season 3 of my save. Just out of curiosity how could you sign Lucas Romero, Gaston Gil Romero and Memphis Depay when Everton has only 5M transfer budget? 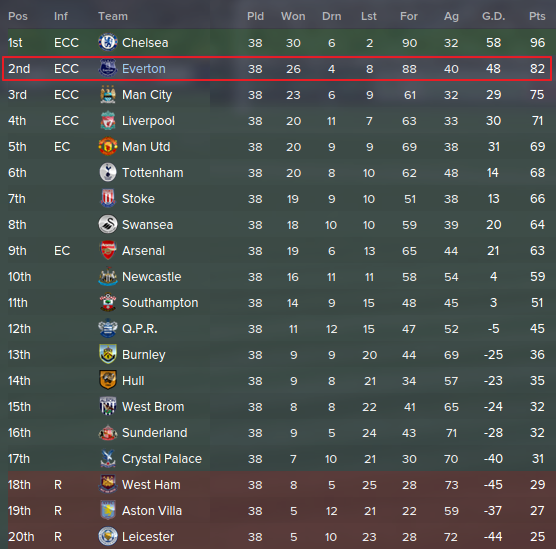 I have now got 8 points from 5 games with Everton in BPL (hard schedule and lots of injuries though). It works very well in attacking but I’ve had problems defensively (for 11-ag 8). How often you adjust roles in the middle of a match? As mentioned Depay wasn’t signed until January at which point we received an injection into the transfer budget. As for the others between setting higher expectations and tweaking the wage budget I gained enough, not to mention I set the majority of the money on installments of 48 months which reduces the transfer budget cost drastically. I also sold Eto’o in January which freed up more wage budget to transfer to the transfer budget. I rarely change the roles, only when its obvious they need tweaks. Hi there, it looks like an awesome tactic gonna try it with Newcastle. Do you recommend any player instructions other than those built-in ? If you have downloaded the tactic then you will have all the player instructions meant for the tactic. I have already replied to you on that post, it doesn’t work consistently enough so I wouldn’t bother trying it, I have already done that. Any clue how this tactic works with patch 15.1.4? Cheers! You’d have to test it, I haven’t had time. I am also curious to see how this has worked. Built my squad around the tactic so I want to see if anyone has tweaked it. I just want to give testimonial on how great this tactic works! Just won the Quintiple with Liverpool in my 3rd season with Darren’s tactic, using only this tactic and just changing the mentality for home/away games. Before I was using a 4-4-2 diamond tactic and it just was not producing consistent results against top tier teams. Using Darren’s Wicked Wings I have defeated top tier teams like Bayern Munich, PSG, Real Madrid, Barcelona etc in Champion’s League play. Of course you have to build up your talent base to get to that point, but this tactic is a fundamentally sound base to building a championship contending side. Thanks, I’m glad this is working well for you. Its the reason we spend so long testing and refining tactics. Great tactic man! I was with AS Monaco and I was having a bad time away until I tried it. Since there, already reached PSG at the top. Glad to hear it, hope the form continues. Thanks, I’m happy the tactic has worked so well for you, hopefully that continues. Was this tactic tested on 15.2.1? what tactic would be your preference once in the premier league,ive just got promoted with derby only lost once to bournemouth using your other tactic.Would you say this was any better? I would stick with what worked last season. Ross Barkley started my game injured until Winter. I used Gaston Romero as the DMC and Lucas Romero at MC. i must say i am impressed with the quick response well done….as for barkley i also have him injured since i am at 15.1.3 version…..so what did you do after barkley returned….you trained him as an advanced playmaker and used lucas romero as box to box and gaston ramires as regista or something else??? I trained Barkley as AP yes and used him there, I then rotated Barry and Lucas Romero as B2B and used Gaston Romero as regista. I have one question, do you think the tactic will work if you change your Advance Forward to a False Nine? I just think that the gap between the lone striker and the midfield is too big. I couldn’t give an accurate answer without testing, so you’d have to try it yourself. Used with Southampton with the most recent patch downloaded and doing wonders! Succeeded to win the treble in the 3rd season and coming 2nd in UCL! Changed AF to CF(s) with Harry Kane scoring most goals in BPL two years straight. AP(a) changed to AP(s) (mainly using Ward-Prowse), just worked out better. A few TI changed during matches depending on how the game was going! 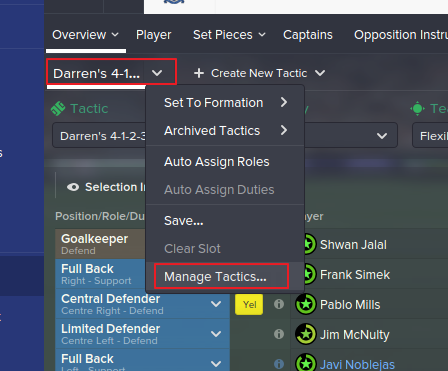 Other than that I kept it all as it was, wonderful tactic Darren, but why am I surprised? With lower league teams it is usually better to simplify tactics, ie be less flexible and make the roles less adventurous. But this tactic isn’t exactly all out fluid Football anyway so I’d say it will vary on the players at your disposal. Maybe change the regista something more conservative to give cover, like a defensive midfielder or ball winning midfielder. But in all honesty, you need to adapt for the players you have, for instance, if you lack speed in the MC positions, it may be better to have a sitting central midfielder as opposed to a box 2 box midfielder who will wear out faster. okey.. but this work in the latest patch`? I haven’t used it in the latest patch, feedback I have seen suggests it varies, can be very good going forward but a little lax at the back, probably varies on your squad I suppose…I would say its not as good as in the previous patches though.